At the end of the Seven Years' War, France lost its North American colonial empire. To preserve the fisheries, France insisted that the fishing privileges guaranteed by the Treaty of Utrecht (1713) be restored and an "abri" or shelter be provided for French migratory metropolitan fishermen. Britain therefore restored the islands to France. In 1763, French authorities took possession of the islands, and by the following year a small French resident population had been re-established. Some of the people were from Ile Royale, from which they had been exiled to France in 1758 following the capture of Louisbourg by the British. In 1766 a number of Acadians settled on Miquelon in the vain hope of resuming their traditional, agrarian way of life. Those who did not give up on the islands after a few years of fruitless attempts at farming turned to the sea, fishing the adjacent waters up to 15 or 20 kilometres away in open shallops. Some of the residents used schooners and brigantines to fish on the St. Pierre Bank, about 75 kilometres away and, to a lesser extent, the more distant Grand Bank; the Banquereau and Green Banks were hardly used at all. Fleets of bankers from France also appeared and quickly established an inter-dependent relationship with the residents of St. Pierre. In spring, schooners averaging 50 tons with a crew of around eight men would depart from France and make for St. Pierre, catching a cargo of fish en route. 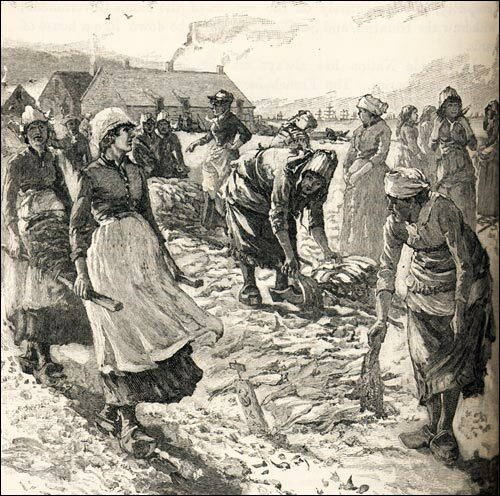 They would unload this first catch at St. Pierre for drying, then return to the banks for a second and even a third load of fish, returning each time to St. Pierre to unload the fish for drying. These first three loads would be delivered to market by vessels other than the banking schooner itself. A fourth trip would be made out to the banks, but this time the schooner returned to France with its cargo, delivering it as wet cod to traditional French markets. In this way, St. Pierre not only developed its own fishing industry, it became a vital element in the metropolitan French bank fishery. In spring, fishermen from France would catch two or three boat loads of fish on the Grand Banks and bring them to St. Pierre for drying. Illustration by Burns. From D.W. Prowse, A History of Newfoundland from the English, Colonial and Foreign Records (London: Macmillan, 1895) 578. "barren and desart..., destitute of all the Necessarys of Life, without Materials for building Houses, or Provisions to support them thro the Winter .... they trust to our Colonies for supplying all their Wants, and invites a Trade in very pathetic Terms, promising to pay for every thing in Molasses, French Goods, or Bills of Exchange"
(PRO Adm 1/482, 25 October, 1763, Lord Colville to Philip Stephens). A brisk trade therefore sprang up between the French islands and itinerant New England traders for a few years after 1763. British officials could not stop this trade, which diminished only when St. Pierre's demand for lumber and provisions fell off in the mid-1760s, when construction of most of the houses, storage facilities, stages, and fishing vessels required at St. Pierre was completed. Thereafter, whatever imported goods were still needed were provided by the expanding bank fishing fleet from St. Mâlo. By then, a trade of a different nature had developed between St. Pierre and Newfoundland. Islanders went to the South Coast to hunt for game and to collect wood for fuel, and for fish flakes and stages. They also began to buy fish cured by Newfoundland settlers. The latter were attracted to this trade because St. Pierre merchants sold supplies and gear at prices as low as half of what British merchants in Newfoundland were charging. In addition to trade, there were cultural ties binding the French at St. Pierre and the nearby residents of Newfoundland together. By 1759 Placentia Bay had become the most Irish part of Newfoundland. They were all Roman Catholics, but the practice of that faith was prohibited in Newfoundland until 1784. Even then, there were few if any clergy available. Thus Irish residents of the Burin Peninsula and south coast came to St. Pierre to have marriages and baptisms performed by the Roman Catholic clergy stationed there. British efforts to discourage these connections were unsuccessful. They stopped only when the outbreak of war forced the evacuation of the islands. This happened twice: once in 1778, when a pending war between England and France caused Newfoundland's Governor John Montagu to lead an expedition against the French islands, and again in 1793, at the beginning of the French Revolutionary and Napoleonic Wars, when an expedition out of Halifax under the command of Captain William Affleck seized the islands. 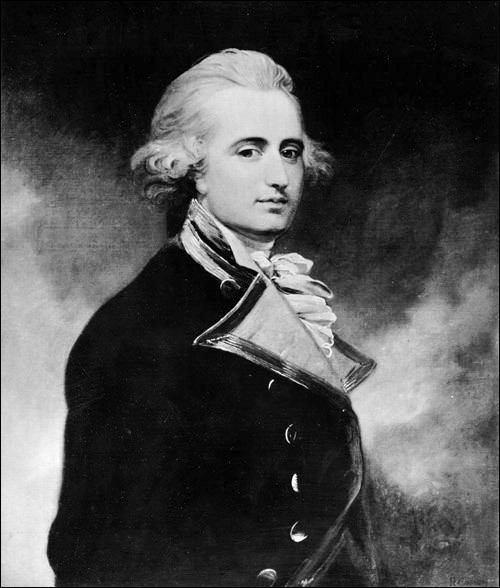 Governor John Montagu (1719-1795), n.d.
Montagu led an expedition against the French islands in 1778. Painting by Richard Cosway. Courtesy of The Rooms Provincial Archives Division (VA 27-21), St. John's, NL. In the first instance, the inhabitants were sent back to France and their homes destroyed. This evacuation was brief; the islands were restored to France in 1783, and the people allowed to return. In the second instance, only the seasonal fishermen and garrison were removed immediately; the 950 inhabitants were permitted to stay until 1794, when orders arrived that they, too, should be evacuated. The island was then taken over and its facilities used by English fishermen until a French squadron under Rear-Admiral de Richery appeared in 1796. Then it was the turn of the English to abandon the islands, and of the French to destroy the town. The islands remained deserted until 1816, when French possession was restored, and a resident population was re-established. Only then were the islands of St. Pierre and Miquelon able to fulfil their intended role of supporting a local resident fishery while serving as an establishment for a French fishing fleet in the North American fisheries.